I am happy to report one of our artist members' exhibitions. At the Jaany annual exhibition each artist shows only one or two his/her works, yet at the solo exhibition you can appreciate a volume of works。I would like to introduce artist member's personal art activity/ exhibition for you to know the artist well. The very first artist is JongWang Lee.He has a solo exhibition at Prince George Ballroom Gallery gallery by Susan Eley Fine Art until April 5. Have a glimpse of the excitement of his exhibition! His friend came over with his favorite (?) SAKE as a gift. Probably Lee is into RED now. 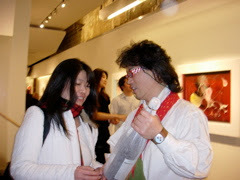 He appeared in white with a red scarf and red and while funky glasses at the reception. Red seems to be a signature color of this exhibition. Many of the painting have saturated red and vivid primary colors. "My Story" Lee says that this work depicts the collision of human nature and wild beast aspect in him. You see human feet and the body of bull tumbling and fighting in one creature. The frame is a part of the work. All works are made by oil paint,resin, and other materials. Lee has mastered the technique of using resin and oil paint and achieved vibrant colors, bold yet delicate fluid lines and shapes, and the depth created by the layers of resin. Each painting provokes your emotional association. I am sorry that I can not show how spacious the gallery is. 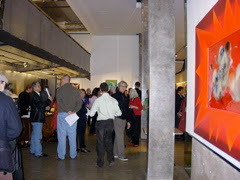 The gallery has high ceiling and lots of wall space. Lee is showing many works in small to fairly large size.Congratulations ! Lee san! !